McAfee Client Proxy (mcpservice.exe) Version 2.3.0.0 no longer has its own service, so when you try to stop the process, even as SYSTEM, it’ll fail with an Access Denied error. So, how to stop McAfee Client Proxy (mcpservice.exe)? Well, with the help of Process Hacker (Process Explorer should also do). Before continuing, let me say that you’ve got to be extra careful and that you’ll be responsible should anything go wrong (these are easy steps though..). 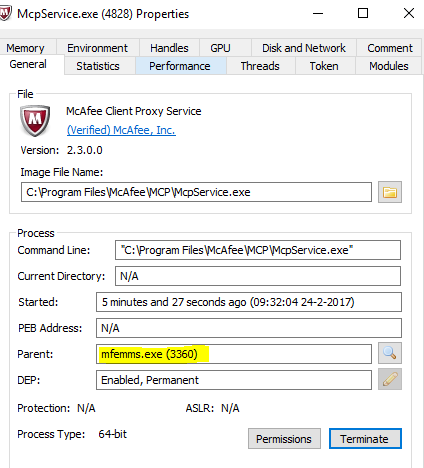 Once I ran Process Hacker, I noticed that the McAfee Client Proxy had a parent process called mfemms.exe that starts from a service called McAfee Service Controller. So that means we’re still going to be able to try and stop this process by working on the parent’s. 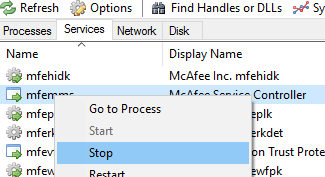 Note: If you’re running an old version of McAfee Client Proxy Service, that has its own service, you may follow the steps below that I will action against mfemms.exe and then stop the process. 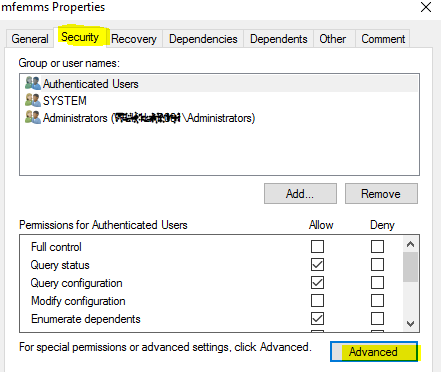 Under the tab Security, click Advanced and change the owner to Administrators. Click Ok twice, until mfemms’ properties window closes. You must run this step in order to run next’s! Now assign Full Control to Authenticated Users and Administrators (just Administrators didn’t work for me). Do the same for SYSTEM if you’re running as SYSTEM. You can finally stop the service. 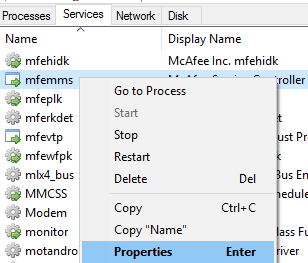 Now that the parent service is stoppped, go back to the Processes Tab and kill mcpservice.exe. After a reboot, the process will start again. 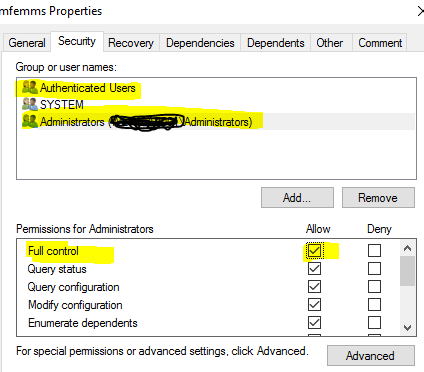 You may disable mfemms service to prevent it from starting again (not suggested as this service may be controlling other important processes/services).